This weekend brings an opportunity to observe the Geminid meteor shower, one of the best and most interesting showers of the year. If the sky is clear where you live, this Saturday morning will provide one of the few nights when it’s almost guaranteed that you will be able to observe a meteor after a few minutes of observing. The Geminids are created by the enigmatic near-Earth object named (3200) Phaethon. For starters Phaethon is an asteroid that only recently displayed cometary activity. Comets create most meteor showers and nearly all comets have orbits that carry them at least as far from the Sun as the orbit of Jupiter. Phaethon, on the other hand, only travels out to a distance of 2.4 AU (2.4 times the Earth-Sun distance), roughly half the distance to Jupiter’s orbit. Based on its orbit it is hard to call Phaethon anything but an asteroid. Orbit diagram of the inner Solar System showing Mars, Earth, Venus, Mercury, and asteroid Phaethon. Note the position of the Earth, crossing Phaethon’s orbit and resulting in the Geminid meteor shower. The Geminids may have formed by the break-up of Phaethon many orbits ago. 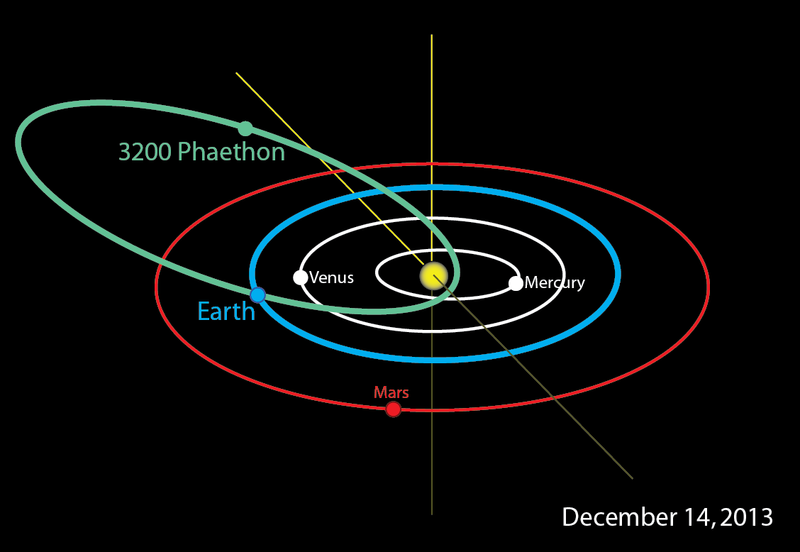 In addition to traveling out to the main asteroid belt, Phaethon grazes the Sun on every orbit, passing within 0.14 AU of the Sun, half the distance to Mercury’s orbit. Sun-watching spacecraft have serendipitously observed Phaethon brighten and form a short tail when close to the Sun. Due to the intense heating some of the rocks on the surface may have fractured, producing a cloud of dust that was knocked off the surface by solar radiation pressure. In effect, it is a ‘rock comet’. At least two additional asteroids that may once have been part of Phaethon have been found. Spectrally, Phaethon is a B-type asteroid meaning it is slightly bluish in color in visible wavelengths. The OSIRIS-REx target (101955) Bennu is also a B-type asteroid. Samples returned by the OSIRIS-REx spacecraft may shed light on the true nature of objects like Phaethon. As the name implies, the Geminids appear to radiate from the constellation of Gemini. More specifically from a point just north of the bright star Castor, the northern star in the Castor-Pollux pair. During the evening Geminids will be coming out of the northeast. By the middle of the night the radiant will be close to overhead and meteors will be raining down on all sides. This year the Geminids are predicted to peak on Friday/Saturday night, December 13/14. Unlike most showers that can only be observed in the early hours of the morning, the Geminids radiant produces a good number of meteors by 10 pm. The radiant is nearly overhead at 2 am and is still well placed for the rest of the night. This year the Moon will hinder Geminid watching until it sets around 4 am. From a very, dark Moon-less night with the radiant overhead, the Geminids can produce over 100 meteors per hour. Since the Moon will be up and most of us live under light polluted skies, rates on the order of a few dozen per hour should be expected. In general it is best not to look directly at the radiant. Meteors are easier to see by looking 30 degrees or more from the radiant (for reference 10 degrees is the width of your hand at arms length). The key is to look up and, regardless of where you look; you should see quite a few Geminids. To increase your chances of seeing the Geminids find a spot with a clear view of the sky. Any obstructions (trees, buildings, etc.) can block some of the meteors. Also find a spot where lights (streetlights, security lights, etc.) aren’t shining in your eyes. This will allow your eyes to dark adapt and you will be able to see fainter, and more, meteors. The most important thing to remember is to get comfortable when observing. A lawn chair is perfect for reclining back and taking in the sky. Remember that it is cold this time of the year so bundle up. It does not take much time, especially when relatively inactive, for the cold to set in. Whether Phaeton is a traditional comet, a volatile-rich asteroid, a split asteroid, or a ‘rock comet’, the result is going to be one of the best astronomical shows of the year. So go out and enjoy the show!